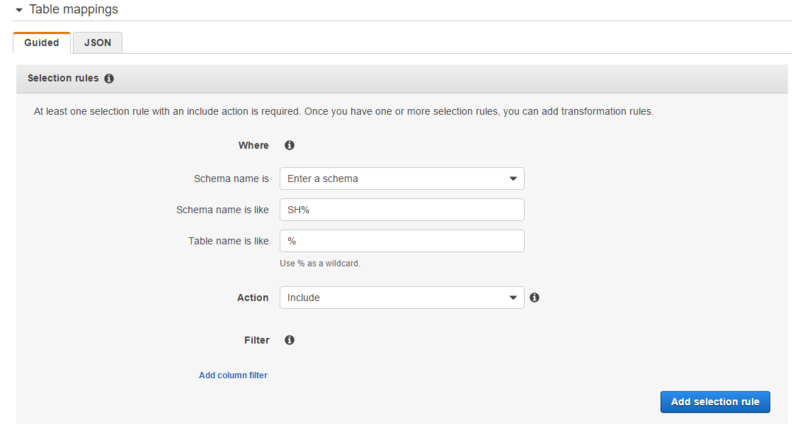 Using an AWS DMS task, you can specify what schema to migrate and the type of migration. You can migrate existing data, migrate existing data and replicate ongoing changes, or replicate data changes only. This walkthrough migrates existing data only. Shows orasource (the Amazon RDS for Oracle endpoint). Shows redshifttarget (the Amazon Redshift endpoint). The page should look like the following. On the Task Settings section, specify the settings as shown in the following table. The section should look like the following. In the Selection rules section, specify the settings as shown in the following table. 5. Choose Create task. The task begins immediately. The Tasks section shows you the status of the migration task.